This series is quickly becoming one of the most popular on the site. 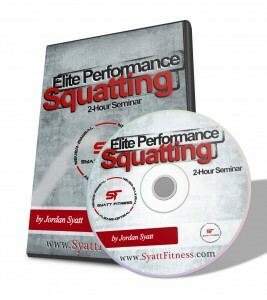 In part one I outlined 3 little-known tips to improve your squat. 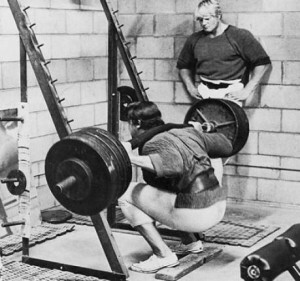 Here, in part two, I dig even deeper and outline 3 more uncommon elite performance squat tips. Ready to squat more than everyone else in your gym? Old-school powerlifting dogma preaches a hard arch in the lower back as optimal squat technique. In fact, I suggest that arching your lower back as hard as possible will be detrimental to your squat performance. Not only will hyper-extending the lower back drastically increase your chance of injury through increasing shear forces on the spine, it also puts the diaphragm, abdominals, and hamstrings in disadvantageous positions from which they can’t function efficiently. Instead of arching as hard as possible, I recommend keeping your ribs down and torso tall. Put differently, try to maintain a vertical torso position without excessively arching your lower back. Squatting in this fashion will allow your abdominals, diaphragm, and hamstrings to function optimally without sacrificing the safety or efficiency of the lift. To illustrate, let’s take a look at the picture below. You’ll notice my torso is relatively vertical (aided by the high-bar position) while my lower back is neutral without excessive lumbar hyper-extension. This position is, in my opinion, optimal for squatting heavy weight in the safest and most efficient manner. I’d note, arching as hard as possible can be beneficial for geared powerlifter’s (those who wear supportive equipment when lifting) but raw lifters fare much better maintaining a neutral spine and ribs down, torso tall position. Great for geared lifters and an effective teaching tool for beginners, the box squat is a waste of time for intermediate & advanced raw lifters. 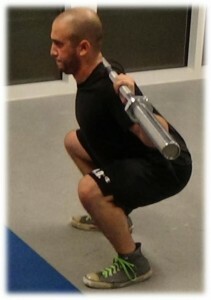 First and foremost, when used for extended periods of time box squats will de-train the stretch reflex. 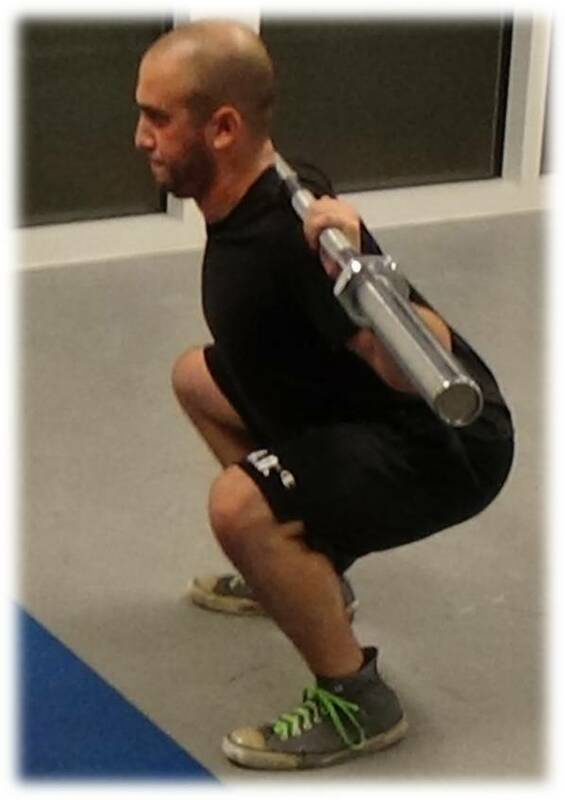 While geared lifters don’t need to worry about this (since their equipment acts as an artificial stretch shortening cycle), raw lifters depend on the stretch reflex to rebound safely and effectively out of the hole. Through sitting on a box you negate the need for a stretch reflex as the movement becomes static overcome by dynamic rather than dynamic in nature. Of equal importance, squatting to a box often causes the lifter to [subconsciously] alter their lifting mechanics. However slight these alterations may be, when performed with a high frequency they can negatively impact free squat mechanics resulting in a weaker squat. Your takeaway: If you want to squat heavy then stick to free squat variations. By all means squat to a box every once in a while but the majority of your training should be spent free squatting. What’s better: high-bar or low-bar? Some swear by low, other’s by high. I don’t think either one is inherently better than the other. Rather, what works “best” is entirely dependent on the lifter (YOU!) in question. As explained in the video, you need to find what works best for your individual needs. Personally, I squat better with a relatively high-bar position as that facilitates a vertical torso which feels best for me. Others, however, (especially those with a longer torso) may prefer a lower bar position as that reduces the lever arm potentially leading to a stronger squat. The major point to understand is there is no “right” or “wrong;” there is only what works best for you! This theme, that of individualization, is what makes my Elite Performance Squat Seminar so unique. In this 2-hour seminar I discuss how to assess your individual needs to understand exactly how to build your strongest squat. If you enjoyed this article you won’t want to miss the third and final part of the series. To be personally notified when it goes live, enter your name and e-mail in the box below.